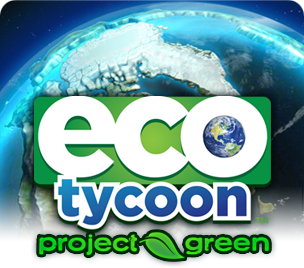 In ECO Tycoon : Project Green, it is up to you to balance the nation’s economy, power levels, food, water, and natural resources while working to reduce CO2 levels and keeping population happy. Research and build cleaner, greener power stations, more productive, eco-friendly methods of agriculture, waste management and transportation. Devise policies to promote awareness of environmental issues and help safeguard the earth for a better future! Hit key ecological targets while working towards an ultimate goal at the end of the time limit or be voted out of office if your popularity falls too low due to bad economical and ecological decisions. Set up government policies such as introducing a carbon tax, subsidizing domestic solar panels and encouraging the use of public transport to try to cut down CO2 emissions and save money. Watch out for natural disasters including earthquakes, tsunamis, oil spills and nuclear waste – they are a direct result of your performance.